It is great to be back. I cannot wait until the next episode. It will be fun for me, because i am a huge nerd, but it will be great for you, because it will feature amazing music!! I too LOVE scores of movies and tv shows. I appreciate what you're doing with this podcast. Keep up the good work. I thought LOST had an incredible score from start to finish. 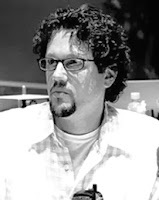 But I also dug Mr.Giacchino's work in the Medal of Honor series and in the new Star Trek. I haven't seen "UP" yet unfortunately. In no particular order. What about you Ralph and anyone else wanna post their top 3 please? I too like Howard Shore, i really like his music to Ed Wood as well of the Lord of the Rings movies. Thanks Ralph. Ahh I loved J.N.Howard's score for The Village! It was so melodious and hauntingly beautiful. I love falling asleep to those cello and violin pieces lol. James Newton Howard is definitely soothing, but he throws in some terror into the mix every now and then. It is hard to sleep to the village when it gets to the loud parts.